The alliance partners must come out with a clear and cohesive seat sharing-arrangement for the Lok Sabha polls – the only visible weak point of the coalition. Is the Bharatiya Janata Party (BJP) making another serious attempt to topple the H.D. Kumaraswamy-led Congress-Janata Dal (Secular) coalition government in Karnataka? Congress leaders, including the party’s powerful backroom manager and state cabinet minister D.K. Shivakumar, have alleged that the BJP is holding three Congress MLAs – Anand Singh (Vijayanagar), Ramesh Jarkiholi (Gokak) and Nagendra (Ballari Rural) – at an undisclosed location. They also claim that the three are not responding to calls from the Congress leadership – even from Siddaramaiah. At the same time, 101 of the 104 BJP MLAs have reportedly been sequestered at a hotel in New Delhi The Congress allegation and the BJP’s move suggest that there is some serious attempt by the saffron party to create instability in the eight-month-old coalition government in Karnataka. Firstly, such an attempt would be a desperate measure by the BJP and is unlikely to succeed as it doesn’t have the numbers to pull off such an act. The Congress JD(S) coalition has 117 members in the house of 224 and the BJP has 104. There are three other members – one each from the Bahujan Samaj Party (BSP) and the Karnataka Pragnyavantha Janatha Party and one independent – and all three are firmly with the coalition government. The BSP member won with the support of the JD(S) and the two others won with Congress support. This makes it 120 for the coalition versus 104 for the BJP. Hence, wooing 3-4 MLAs does not threaten the coalition government. The BJP needs at least 16 members to abstain and to hold on to its flock firmly if it is to brace for a confrontation of numbers in the house. The Congress party and the JD(S), on their part, are not new to holding their flock together. D.K. 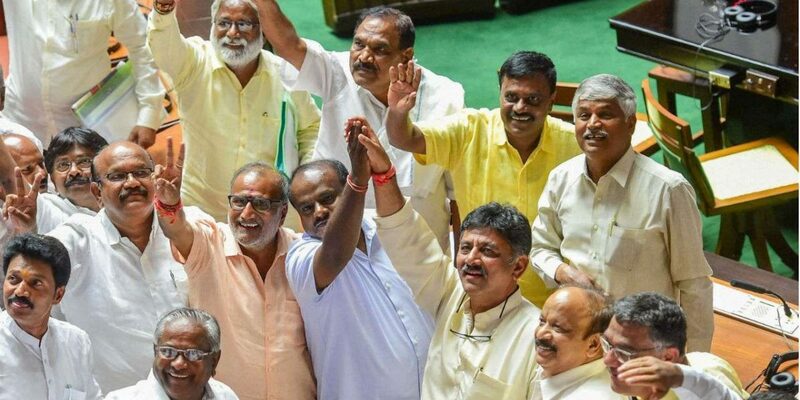 Shivakumar and chief minister Kumaraswamy are notorious for their ability to hold MLAs – which will make it more difficult for the BJP to even attempt a significant number. However, the threat will always be hanging over the coalition. In fact, the BJP’s efforts are not just to topple the government, but to break the Congress-JD(S) alliance. The arithmetic of the two coalition partners is so strong – as was evident from the Ballari bypoll results – that the BJP may face massive trouble in winning even the safe seats against the combined might of the two partners in the Lok Sabha polls. This is why the BJP is desperate to break the alliance. Further, Karnataka has huge funding possibilities in a national campaign and the saffron party may want to curtail that by bringing instability in the state. However, the game is for the Congress-JD(S) to lose and not the other way around. One of the major sticking points in the Congress-JD(S) alliance is seat-sharing for the Lok Sabha polls. The JD(S), which won only two seats in 2014, wants at least ten and has declared this demand in public. The Congress, however, cannot afford to give away so many seats and would like to confine the JD(S) to around five. Further, the JD(S) is demanding more than its share of seats in the old Mysore region and that may be difficult for the Congress to part with. To cement the seat-sharing arrangement would be the main challenge before the alliance partners. Till this arrangement is sealed with categorical clarity and a healthy atmosphere of trust, the BJP will make attempts to fish in troubled waters. Thus, it’s crucial for the coalition partners to release their seat-sharing details at the earliest. The leadership of the two parties must categorically back such an arrangement on the face of expected disgruntlement from local cadre. In fact, efforts by the BJP to topple the government must be seen by the Congress and JD(S) as an opportunity to show the strength of the alliance and ensure that differences between the two do not manifest into instability for the government. Further, the two parties need to send out a strong message to MLAs hobnobbing with the BJP and perhaps take the risk of losing 1-2 leaders to disciplinary action. Such a measure would send out a clear message to the rest of the flock. T.M. Veeraraghav is an independent journalist.